Today is #NationalPickleDay! To If you’ve ever tried naturally-fermented pickles, you’ll never go back to vinegar-based ones. Not only is the flavor much more complex and superior to their counterparts, they are also full of health-promoting probiotics. Thankfully, they are also simple to make. Long before pickles were made by pouring vinegar and spices over vegetables, they were made using the same type of brining and submerging processes that brought us sauerkraut. Over the years, companies and home cooks opted for using vinegar since the resulting pickles were completed in shorter periods of time, which meant higher profits for them. However, the slow food process of making pickles through fermentation is far superior. That’s because the flavors are more naturally-developed and less acidic than vinegar-based pickles. Chop your cucumbers or zucchini (both work well) into the size of pickles you’d like. Alternatively, use pickling cucumbers and leave them whole since their small size lends itself to fermentation. Place them in a fermentation crock or wide-mouth mason jar . Pick a crock or mason jar that’s close to the size of the amount of produce you’re preparing. So, if you estimate that you have enough cucumbers for a quart jar, use that size. Be sure to leave room for some weights at the top to hold everthing submerged under the brining liquid. To prepare a brine, which is just a salt-water solution, you’ll mix 3 tablespoons of finely-ground sea salt per quart of water. You’ll need enough to cover the vegetables to prevent them from rotting. You’ll pour the brine over the vegetables, place a plate over the ingredients if you’re using a crock and then food-grade weights on top of the plate to hold everything submerged in the brine. If you’re using mason jars, you can purchase fermentation weights that fit wide-mouth jars and submerged your cucumbers or zucchini in the brine. Cover and allow the vegetables to ferment. You’ll also want to add various flavorings to your pickled vegetables; they can include herbs and spices, onion and garlic, chilis to add heat, or any other flavor you might like. You can experiment with a wide variety of vegetable pickles. I’ve shared my recipe for Spicy Dill Fermented Pickles below but I make a wide variety, including Taco Pickles (which are small enough to fit in a taco shell, hence the name), veggie pickles, zucchini pickles, and good old-fashioned dill pickles. You’ll notice that the cucumbers in my Spicy Dill Fermented Pickles are cut into long slices. Of course, feel free to try whatever suits you best, keeping in mind that you’ll need to keep them submerged in the brine and the smaller the vegetable size the harder that can be. You’ll need to use sea salt or Himalayan crystal salt instead of iodized salt since the iodine prevents the growth of beneficial microorganisms. While most pickles available in grocery stores are made with white vinegar and have few, if any nutritional benefits, these ones rely on the traditional method of fermentation to develop the flavors and boost the probiotic benefits of the pickles. Fortunately, once you’ve tried these delicious dill pickles and discover how easy they are to make you’ll be happy to leave the less healthy pickles behind. Cut the cucumbers lengthwise in quarters. Place in the fermentation crock or jar of your choice. Add the chili peppers, garlic, and dill leaves. In a pyrex or glass pitcher, combine the water and salt. Stir until dissolved. Pour over the cucumber mixture until all ingredients are submerged + an additional ½ to 1 inch to cover. Use fermentation weights or previously boiled rocks to keep ingredients submerged. Cover with a lid and allow to ferment in a cool, undisturbed location for five days to one week, or longer if you prefer a tangier taste. 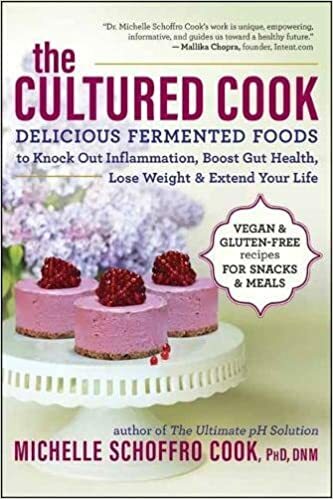 My recipe for Spicy Dill Fermented Pickles is an excerpt from my book THE CULTURED COOK: Delicious Fermented Foods with Probiotics to Knock Out Inflammation, Boost Gut Health, Lose Weight, and Extend Your Life. DR. MICHELLE SCHOFFRO COOK, PhD, DNM is a registered nutritionist and international best-selling and 20-time published book author whose works include: THE CULTURED COOK: Delicious Fermented Foods with Probiotics to Knock Out Inflammation, Boost Gut Health, Lose Weight, and Extend Your Life, 60 Seconds to Slim, The Probiotic Promise, and Boost Your Brain Power in 60 Seconds. Her work has been featured in Woman's World, First for Women, Reader's Digest Best Health, Health, Huffington Post, Reviews.com, WebMD, and Care2.com. Learn more about her work at DrMichelleCook.com. Earlier I mentioned that there are many types of starter cultures that can be used in plant-based cheese-making. Miso is one of my favorites. It has a mild, naturally-aged and rich, slightly nutty flavor that beautifully lends itself to aged plant-based cheeses. I started a recent holiday tradition where I begin making this cheese a few weeks before Christmas. Once the initial culturing process is done, I form the cheese block and rub it with sea salt and set it on a wire mesh rack in a cool space to allow it to ferment for the remaining days until Christmas Eve. Then Curtis and I enjoy a beautiful holiday cheese platter with this cheese as the star. With three weeks of aging time, it develops a firm texture and sharp taste that is delightful with pomegranate arils and mandarin oranges, walnut halves and figs, making it the perfect Christmas cheese and a wonderful, unique holiday tradition in our home. This year I plan to start early for a longer aging time and a richer, stronger cheese. Place the cashews, water, and miso together in a glass bowl with a lid. Stir until combined. Cover and let sit for 24 hours. Pour the cultured cashews into a blender. Add 1 teaspoon of the salt and the coconut oil and blend until smooth. This may take a few stops to push ingredients down until it is blended together. Pour the cheese mixture into a cheesecloth-lined bowl that is the shape you’d like the finished cheese to be. Refrigerate for 4 to 6 hours or until firm. Remove from the bowl and remove the cheesecloth. Using the remaining 2 teaspoons of sea salt, gently rub the salt over the full surface of the cheese (bottom included). Gently place it on a wire rack and place in a cool, dark, and undisturbed place to allow the cheese to air-dry for two to three weeks. 1. Smoothies—Blend some yogurt or kefir (a fermented dairy or fruit juice beverage) with a handful or two of fruit for a delicious smoothie. 2. Frozen Yogurt—After making a fruit smoothie, pour it into popsicle molds for a frozen yogurt treat. 3. Yogurt Cheese—Pour yogurt into a cheesecloth-lined sieve and let it sit for at least a few hours for a soft yogurt cheese—simply add your favorite herbs for an unbeatable fresh cheese. Like all of the yogurt-based suggestions, these approaches work for vegan yogurt as well. 4. Yogurt Salad Dressing—Blend some yogurt with lemon juice or vinegar and some herbs and sea salt for a creamy salad dressing. 5. Save Yogurt to Make More—Save a few tablespoons of yogurt or the whey from yogurt-making as the starter culture to make even more. 6. Breakfast Cereal—Add a dollop or two of yogurt or kefir to your favorite breakfast cereal or oatmeal in place of milk. 7. Over Brown Rice or Quinoa for a Quick Meal—Simply adding sauerkraut or other fermented vegetable dish to cooked grains (after the grains have cooked) makes a quick, nutritious, and delicious meal. 8. Over Salad—I threw some sauerkraut on top of a homemade Caesar salad and it was delicious. You can add fermented veggies to almost any salad for a quick probiotic boost. 9. On Noodles—Tossing brown rice or other whole grain noodles with kimchi or pickled veggies makes mealtime a cinch. 10. Sandwiches—Adding pickled turnip, fermented onions, kimchi, or sauerkraut to your favorite sandwich gives it a flavor and nutritional boost. 11. and 12. On Burgers and Hot Dogs—This one is fairly self-explanatory. 13. Lettuce Cups—Place freshly-grated vegetables, bean sprouts, and fermented veggies or kimchi in a large leaf of lettuce and wrap it up for a simple snack or meal. 14. Salad Rolls—Soak rice paper wraps in hot water, pat dry, and wrap them up with fermented and fresh veggies and kimchi. 15. Tacos—Top your favorite tacos with fermented vegetables like carrots or onions for a flavor boost. 16. Salad Dressing—Blend sauerkraut or kimchi with some 2 parts oil and 1 part vinegar for a quick and easy salad dressing. 17. Condiments—Add pickled vegetables or kimchi as a condiment to almost any meal. 18. Guacamole—I mix an El Salvadoran fermented salsa known as Curtido with mashed avocado for a simple and amazingly delicious guacamole in minutes. 19. Salsa and Chips—Mix fresh salsa ingredients: chopped tomatoes, onion, garlic, lemon juice, and minced chilies with the contents of one probiotic capsule and let sit for at least a few hours but preferably overnight. Then serve your fermented salsa with chips for a great snack. 20. Hummus—Blend sauerkraut (or sauerkraut juice) and chickpeas with a little extra virgin olive oil for a quick and probiotic-rich hummus. The sauerkraut and sauerkraut juice adds flavor and replaces salt in this recipe. 21. Fermented Juice—Empty the contents of a probiotic capsule into your favorite fruit or vegetable juice, cover and leave at room temperature overnight or for a day. Not only will you get the probiotics found in the capsule, but the beneficial microbes will proliferate and actually reduce the amount of natural sugars present in the juice. 22. Choose Kombucha over Soda—Skip the sugar-laden soft drink and instead enjoy a naturally-sparkling kombucha (a probiotic-rich beverage). 23. Cultured Cream—Soak raw, unsalted nuts like cashews, pine nuts, or macadamias in enough water to cover and the contents of one probiotic capsule. Let sit for 8 hours or overnight. Blend. Use over fruit in place of cream. Use only as much of the soak water as needed for a thick vegan sour cream. 24. Vegan Cheese—Follow the instructions under 23 but use only enough water to cover the nuts and allow them to ferment with the probiotic powder for at least 24 hours or longer for a sharper cheese flavor. Blend until smooth and creamy for a quick and probiotic-rich soft cheese. 25. Vegan Pudding or Cheesecake—Follow the instructions for vegan cheese but add some fruit and sweetener (if you wish), along with a couple tablespoons of a thickening agent like ground chia or flax seeds. For a cheesecake, crumble some graham crackers or cookies with a small amount of coconut oil and press into a small cheesecake mold. Pour the fruit-cashew mixture over the crust. Refrigerate until firm, et voila! Enjoy a simple, raw, probiotic-rich pudding or cheesecake.